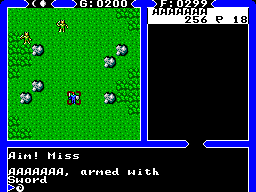 Ultima IV is a hard-core RPG. 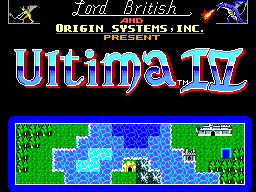 Forget about the cutesy graphics and simplified gameplay of Japanese RPGs; Ultima IV has a loads of statistics and attributes, an absolutely massive world to explore, loads of stuff to buy, and a complicated but interesting spell system involving a huge magical ingredients. This makes it quite different to other SEGA RPGs, and would not appeal to everyone. For some reason only the 4th title in the series was converted to Master System, but it has the most well developed plot of the series (the Quest of the Avatar) which goes on to define the main character's role in all of the following titles. Battles are a turn-based affair which eventually become quite tedious (you find yourself doing your best to avoid random battles) but the mechanics work well. Most of the game involves moving a group of characters through a huge tile-based world, one square at a time, but on the way talking to various characters, buying and selling equipment, sailing ships, flying in balloons, riding horses, travelling through the mysterious 'gates', and trying to figure out what the main quest is all about. 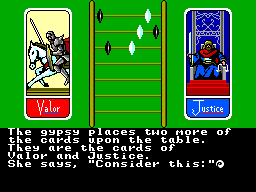 The graphics on the SEGA master system are the best of all of the incarnations of Ultima IV. The Apple II version looks a bit better generally, but the SEGA version has 2D overhead dungeons, which are a huge improvement over the extremely confusing pseudo-3D dungeons found in the other versions - if you're going to play the whole game through then definitely play the SEGA version. Compared to other SEGA titles the game is a bit hard on the eye as there are a lot of tiles drawn to screen at one time and therefore detail of each tile isn't great. The music from this game is still burned into my brain 20 years later. The very short, extremely repetitive songs will never go away. They suit the game though. You can save and load your game (status) which is pretty cool for a SEGA game. In the computer version you can press lots of different keyboard shortcuts, but on the Master System you end up scrolling through long lists of things which isn't too bad. Loads of replay. After finishing the main quest (it took several years) I now have closure and will never play it again, but otherwise yes there are 8 different starting characters to play as (mage, bard, druid, shepherd, tinker, paladin, fighter, ranger) and a huge world to explore in different directions. There are also lots of little secrets to find scattered around the world; usually found by talking to various people, or at certain phases of the moons (there are two moons) etc. Gameplay is extremely rich with a lot of depth. I gave the graphics a score of 8/10 due to the 2D overhead dungeons being great; otherwise it'd rank a bit lower compared to other games. Music and sound are something like a demented leprechaun constantly drinking red bull playing a xylophone as fast as possible. Control are fine, and replay value is excellent. Probably my favourite SEGA game.